Hiram’s heart began pounding in his chest, but he wasn’t sure if it was more out of anticipation than fear. He had faced tense situations before, like when he was thrown in jail for preaching to and educating slaves in St. Louis and in combat during the Civil War. This was different though. It was historical, life-changing and a precedent for the future of the country. Just as he fought for the Union on the battlefield, he was fighting again for unity in the Senate chamber. Only time would tell if this was going to be as bloody. Hiram knew his appointment was political. Mississippi wanted to re-enter the union and agreed to this nomination for the good of the state. U.S. Senators stood one-by-one to state their case. Some showed immense support. Others questioned his eligibility to even be there. Republican Senator Charles Sumner (see The Birth Of A Movement) pronounced, "The time has passed for argument. Nothing more need be said. For a long time it has been clear that colored persons must be senators." And with that, on a 48 to 8 vote down Republican-Democrat party lines, Hiram Rhodes Revels was admitted as the first black man into the United States Senate on February 25, 1870. Revels was born in North Carolina on September 27, 1827, to a black Baptist preacher and his Scottish wife. The family was free, as was Revels. He received an education, even though it was illegal at the time for blacks to do so, eventually attending two seminaries. He was ordained in 1845 in the African Methodist Episcopal (AME) Church. Much like Frederick Douglass (Reading, Writing, and Redemption), Revels traveled the country preaching the gospel and educating blacks. Even though free blacks were prohibited from living in Missouri, he took a call in St. Louis anyway knowing the restriction was rarely enforced. He once stated, “It being understood that my object was to preach the gospel to them, and improve their moral and spiritual condition even slave holders were tolerant of me.” Unfortunately his luck did not last very long. He was arrested in 1854 for preaching to the black community. Shortly after his release Revels took a position in Baltimore, Maryland, where he worked with his brother, Willis, in a Presbyterian Church. In addition to his ministerial duties, he was a principal of a black school. Revels continued his own education at Knox College in Illinois, becoming one of the only black men at the time in America with some college education. By the time the Civil War broke out, he was back in Baltimore. Revels not only recruited blacks for the war, he became a chaplain for a black regiment and fought as a Captain in several battles. Over the next few years Revels traveled the country, again educating and preaching to the black man. He even returned to St. Louis to found a school for the freedmen before settling with his wife and 6 children in Natchez, Mississippi, in 1866. During the Reconstruction period, Revels became one of the many black Republicans elected to state’s legislators. He made an impression on opening day after giving an inspiring prayer. The first order of business in 1870 was to replace the two Mississippi U.S. Senate seats vacated by Jefferson Davis and Albert Brown upon secession. Brown’s term had one year left with Davis’ ending in five years. The Republican led legislature proposed that Brown’s would be filled by a black man and Davis’, a white. Revels and the other blacks agreed hoping it would “be a weakening blow against color line prejudice.” On the flip side, Democrats saw it as a blow against the Republican Party. It took three days and seven ballots, but lawmakers selected Revels to fill Brown’s seat in an 85 to 15 vote on January 20, 1870. He immediately traveled to Washington but Congress still needed to readmit Mississippi to the Union, which didn’t occurred until February 23rd. Senate Republicans did not waste any time working to swear Revels in. Senate Democrats did not waste any time working to stop them. Democrats spent two days finding every possible reason not to seat Revels, from Mississippi not being eligible as a state to have U.S. Senators to Revels not being personally eligible due to citizenship. As I stated in Disunity of the Union, because of the Dred Scott Decision (see Dreadful Scott Decision), blacks were not considered citizens until the 14th Amendment was passed two years earlier. Senators were required to be citizens for nine years before serving. Republicans quickly mobilized around Revels and won. He not only was sworn in, he was granted seats on the Committee on Education and Labor and the Committee on the District of Columbia. While in office he took strong stances, such as equality for everyone. The Radical Republicans lobbied to severely punish Civil War rebels while Revels, as a man of God, practiced what he preached and sought forgiveness for those who repented. Revels promoted restoring citizenship to former Confederate States along with personal and civil rights for blacks. Understanding that separating the races, such as in schools, would lead to hostility between blacks and whites, Revels rejected any proposal or notion supporting the practice. That being said, he also did not support forcing the races to mix as that too could lead to resentments and friction. Upon his return to Mississippi at the end of his term in March of 1871, Revels co-founded Alcorn University and served as its first president. He took a short reprieve to serve as Mississippi’s Secretary of State and retired permanently from the University in 1882 due to poor health. He continued to minister and teach until his death on January 16, 1901. 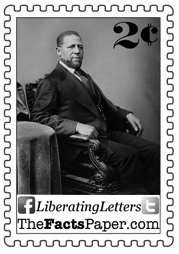 A free black man his entire life, Hiram Rhodes Revels believed the Gospel and education were the key to freedom for all men. He spent his life living his principles, teaching his principles and fighting for his principles. He was a man who saw beyond color and politics, and believed in forgiveness and mercy for all. This, Liberty, is the key to healing a nation. Unfortunately, the presidential races for both parties have fractured any unity that was left in this country. Name calling, false accusations, and a reality TV atmosphere have overtaken a process of judging candidates on their issues. There are bitter feelings, anger, and animosity on all sides. Revels, taking Lincoln’s lead, followed the motto, “With malice towards none, with charity towards all.” This approach, Liberty, only after the country turns back to God and begs forgiveness, will heal America. I’m afraid with the current front-runners, though, this is not going to be the direction of America in the immediate future, at least not for the majority. We will continue to stand and fight though, just as Revels did, even if it is unpopular with our party, our race, or our family.